Ardentinny Community Councillor Malcolm Bartley raises a point with Murdo MacDonald. 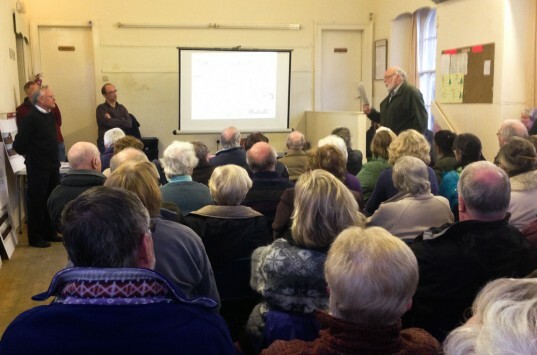 A crowd of 70+ crammed Blairmore Village Hall on Saturday 24 November to attend Kilmun Community Council’s Open Day to discuss the proposed Wind Farm at Cove. The meeting began with the Roseneath Peninsula West Development Trust (RPWDT) giving their presentation of the proposal. They cited the reason for the development as being an attempt to save their dying community and projected that revenue earned from the grid would go towards financing affordable housing, which in turn should help save the local school; the provision of sheltered housing; play areas and other projects identified in their Community Action Plan. Chairman of the Trust, Murdo MacDonald also reported that the Trust had recently changed its Memorandum and Articles to permit it to give funds to communities other than its own and that it was planned to give £22,000 annually, for the initial 15 years of the windfarm’s lifespan, to an independent body set up for the purpose of receiving these funds for the communities of Kilmun, Blairmore and Ardentinny, as they would be the most affected by the development. These communities would decide how they wished to spend the money and the RPWDT would require an annual report on how it had been utilized. – the proximity of flight paths. – the potential effect on a nearby nature reserve. 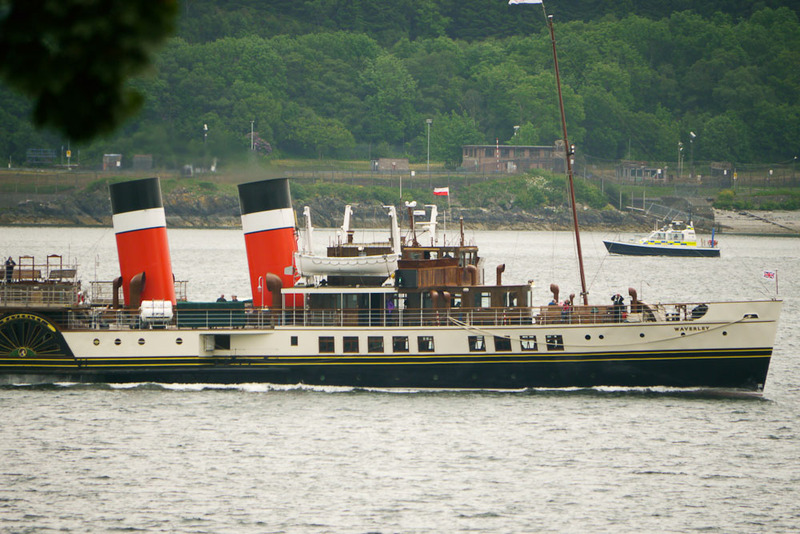 – the noise factor and how it may be magnified travelling across Loch Long. – the visual impact on Shore residents, visitors, and ferry and cruise ship passengers. All of these concerns were answered with specific reference to the Draft Environmental Impact Assessment which had been undertaken. However some of those present were unconvinced and there was prolonged discussion and disagreement regarding the photomontages used to portray the visual impact from specific points in Cowal. The RPWDT explained that these had been produced in accordance with statutory regulations. When the RPWDT left there then followed a discussion by the attending public, chaired by Kilmun Community Council’s Chair. Here concerns and criticisms were reiterated and it was mooted that the sum being offered to the Shore communities was unacceptably low. However, not everyone was against the development project. Some were supportive of the RPWDT’s efforts to rescue its ‘dying community’ and to address the bigger picture of the future of the younger generation and their children etc. One gentleman reported that he had done some considerable research on the internet which was inconclusive on the issues raised because he found that where one piece of research would support a particular argument, another would refute it. Another summarised by saying that the RPWDT had made their presentation supported by research and documentation but the counter-arguments from the floor appeared not to have similar documented support. The Chair concluded that Kilmun Community Council could either do nothing or object to the planning application on behalf of the community, if it had a mandate to do so. Ballot forms (see below) together with a template objection letter had been distributed to residents and those in attendance, in order to elicit their opinion regarding the development. There were complaints that these ballot forms displayed a bias although Kilmun Community Council vigorously denied any intention of this. When asked what would constitute ‘a mandate’ the Chair responded saying a simple majority, i.e., e.g., of 1. Completed forms should be returned to Strone Post Office before Friday 30 November and any completed by residents of Ardentinny will be forwarded to Ardentinny Community Council to be dealt with by them. Download Ballot form/Template objection letter (PDF). As well as a simple majority, surely community councils require at least a 50% resident response before they can assume they have a community mandate?! Trick of the eye distorting turbine application photos!!! I noticed that the question of photomontages came up again!! well it’s fine saying that these were produced I.A.W Stat Regulations however what is not said is these regulations always work towards the wind farm developers and not for the objectors. I would therefore urge you to read the link below because this will explain how photomontages do not show the full and correct picture. This has been proven on many occasions. You will be shocked how simple these are so misleading to the general public!! !